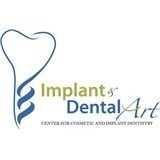 Implant & Dental Art (Vienna) - Book Appointment Online! Dr. Juanli Guo is an American Board of Prosthodontics (ABP) certified prosthodontist. Dr. Guo received her prosthodontic specialty training and obtained both Certificate in Prosthodontics and PhD in Oral Biology (with focus on bone regeneration and implant-to-bone osseointegration) from the University of North Carolina at Chapel Hill. The specialty training in prosthodontics focuses on comprehensive planning and treatment involving full-mouth rehabilitation, crowns, bridges, veneers, complete dentures, removable partial dentures, and implant therapy. Very meticulous and professional, extremely pleasant, excellent results (tooth implant).